I tried staying up till midnight on Thanksgiving, so I could watch the new Gilmore Girls. I didn’t last but I was up early on Friday and I didn’t leave my couch till all four episodes had been watched. And I am currently rewatching them (but I promise there won’t be spoilers in this, just in case you aren’t as obsessed as I am and haven’t watched them yet). I am mainly rewatching because in the previews they showed Lorelei and Rory having a conversation that referenced Amy Schumer. And I didn’t see that scene when watching the actual shows. Which has me scared that I missed parts. And that is not acceptable. Plus I want to see Logan shirtless again (episode 4, 26:30 mark 🙂 ). Because OMG. This picture doesn’t do him justice. How did all of her ex’s end up being so gorgeous? In fact, how did all the guys age so well? In a word, Christopher. And do you all know about the actor who plays Doyle? He created the show Empire! How surprising is that? Doyle wasn’t the only actor who came back. Pretty much everyone was back, some with larger roles then others. And there were great cameos by other actors – 3 from Amy’s show Bunheads and 3 from Lauren’s show Parenthood. Sadly (and really, this isn’t a spoiler), Marty wasn’t back. Am I the only one who wanted Rory to end up with him? I loved him. I also loved Digger. Don’t get me wrong, totally Team Luke, but I would have been equally happy to have had her be with Digger. He had a dog that knew the command “a little to the left”. How can you not love that? I also loved how the episodes mocked 30 somethings. It wasn’t even subtle. It was just continuous and awesome. Reminded me of these great skits, which I am posting so you can enjoy too. So while Michael was a very good sport about my sitting inactive for 6 hours on Friday, I can’t pull that off a second time so soon after. Therefore, I have been making sure I have other things to do that justify me staying home while watching netflix. 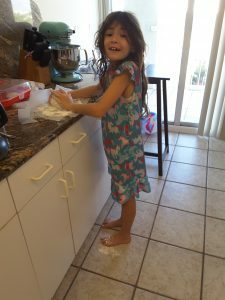 I paid bills, did some admin on this blog, and have been cooking. This morning I made biscuits. This was actually only partly so I could watch Gilmore Girls. The other reason was that I have apple butter and I wanted to heat it up and eat it with the biscuits, the way I did last month at Yard Bird. If you are ever in Miami, Yards Birds in South Beach is a must. Sunday brunch is best but lunch is good too. 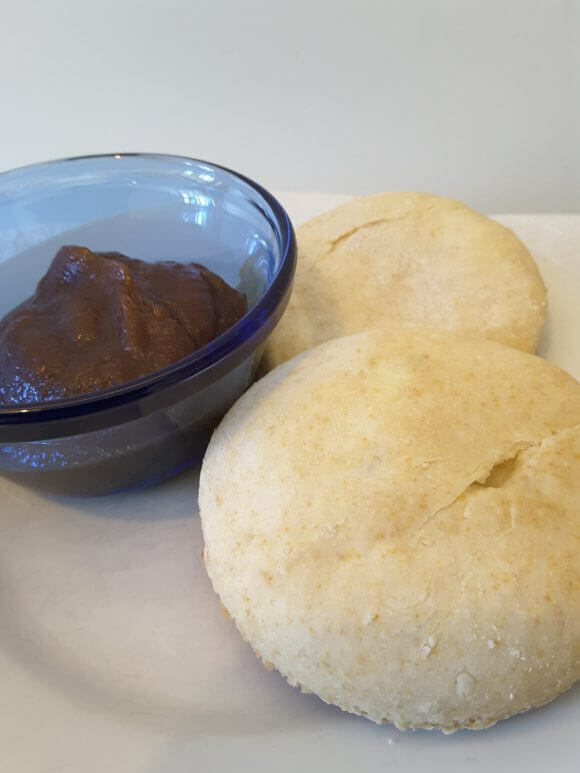 If you are not fortunate enough to be near Yard Bird, buy some apple butter, heat it up and make these biscuits to serve it with. It will still be a great experience. In bowl, combine flour, baking powder, salt and cream of tartar. Cut in butter and combine till crumbly. 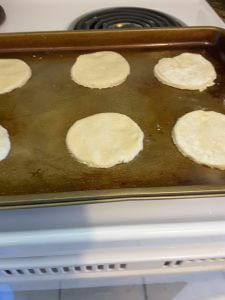 Roll out dough to 3/4 inch thickness (the biscuits don't rise that much so how ever thick you roll them is pretty much how thick they will be). 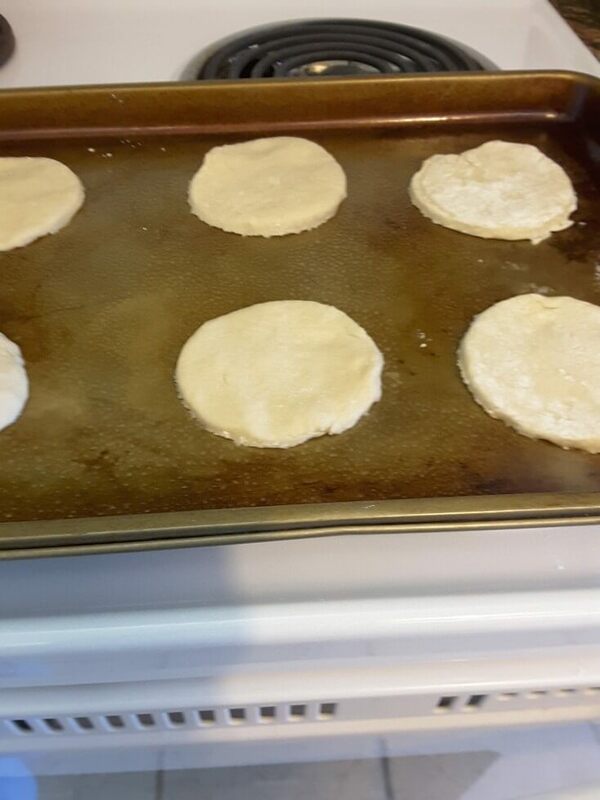 Use the mouth of a cup to make circles in your dough, cutting out the biscuits. Place 1 inch apart on greased baking pan.